Ergonomics is the science of designing tasks, equipment, tools, and work environments to accommodate the capabilities and limitations of the majority of the workforce. Ergonomics enhances human performance including health, safety, and productivity. Ergonomics efforts in mining aim to prevent musculoskeletal disorders by reducing exposure to awkward postures, high force exertions, and task repetition. Outdoor and underground work environments exacerbate exposure and make ergonomics efforts more challenging than in other industry sectors. According to an OMSHR study comparing 1983–1984 and 2003–2004 MSHA data, the percentage of cumulative injuries was similar (37% and 33%), but many more work days were lost due to injury in 2003–2004. Cumulative back injuries decreased by 10%, potentially due to use of assist devices, but cumulative knee injuries increased by 8%, possibly a result of kneeling/crawling in low-seam mines. Worker bends to perform manual greasing. The NIOSH Mining program's recent and current research has been designed to provide tools to help mines identify risk factors and implement and audit ergonomics processes, as well as provide specific interventions to address ergonomics problems in mining. Two recent projects involved developing ergonomics audits for specific types of operations (haul truck operation, bagging operations, and maintenance and repair in processing and preparation plants) and developing a knee pad for low-seam mining environments. These projects used a mix of laboratory and field investigations to assess the problems and develop guidelines for remediating ergonomics issues. 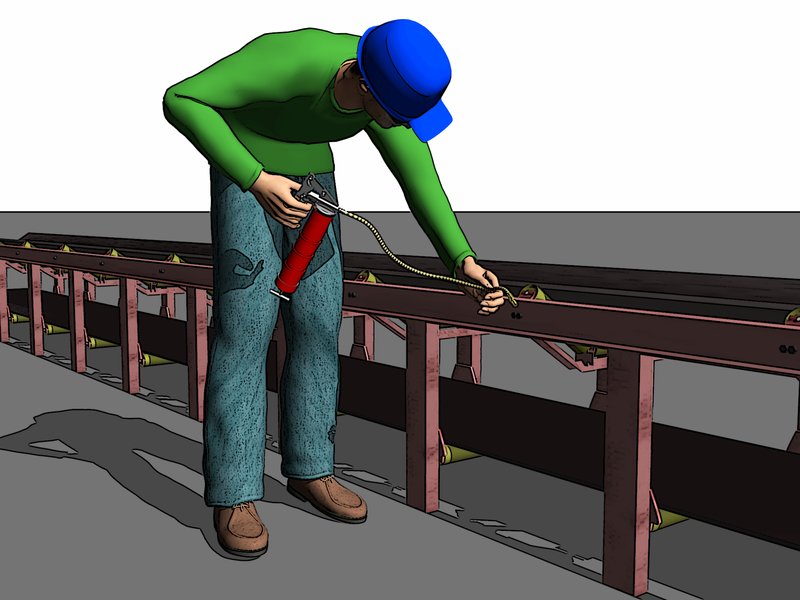 Cumulative injuries are a major financial burden to the industry, but using NIOSH-developed tools for incorporating ergonomics in the workplace was shown to be a tremendous success, indicating that ergonomics can be used to reduce injuries and costs. NIOSH Mining has published two ICs on ergonomics processes and participatory methods for mines: Ergonomics Process and Risk Factor Awareness. Practical Demonstrations of Ergonomics Principles was developed to provide safety trainers with several demonstrations for teaching ergonomics principles to mine workers. With attention focused on the knee, NIOSH Mining published on preventing injury in Keeping Knees Healthy, and summarized experimental investigations of pressures and moments on the knee during different activities and while wearing different knee pads. It details stress distributions while wearing commonly-worn kneepads as well as physiological and biomechanical responses due to different postures and modes of locomotion. The audits have been published as an Android application for phone and tablet use, and are available in the Google Play store. The paper version of the ergonomic audits will be published soon.